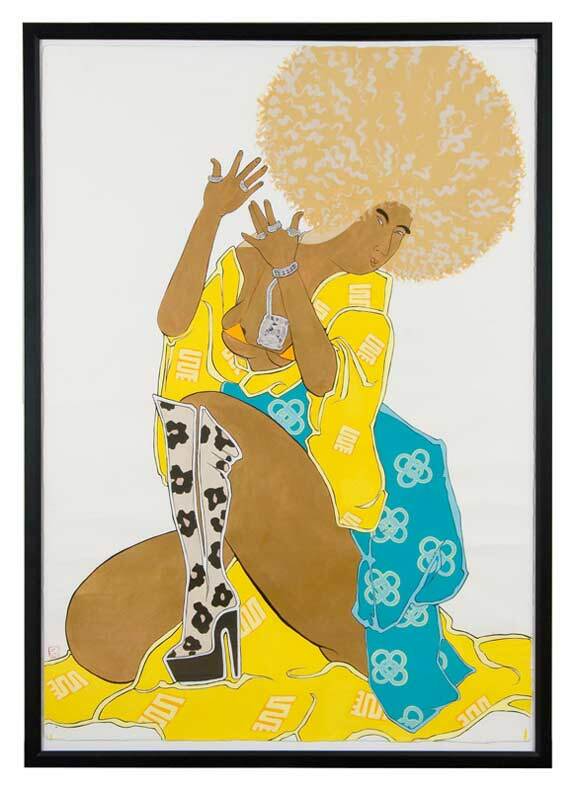 Iona Rozeal Brown, A3 Blackface #76, Courtesy of Saltworks Gallery. NASHVILLE, TN.- Cheekwoods Temporary Contemporary series presents the work of Iona Rozeal Brown. In her work, the artist adapts the Japanese tradition of Ukiyo-e woodblock prints to contemporary culture. Ukiyo-e prints were popular in 17th through 19th century Japan for their images of ephemeral entertainment such as fashion, popular actors and musicians, and famous geishas. Brown has adapted the formal style to comment on the effects of cross-cultural currents. She focuses on the appropriation of mainstream hip-hop culture by suburban American and urban Japanese youth. Her subjects dawn hip-hop apparel, are clad in flashy jewelry, and appear in Black-face make-up. As a result, her work questions the effects of culture imitation.